Our escorted tours give you a unique opportunity to meet like-minded travellers, discover iconic monuments, learn from charming local people and marvel at spectacular natural splendours that will leave timeless impressions. 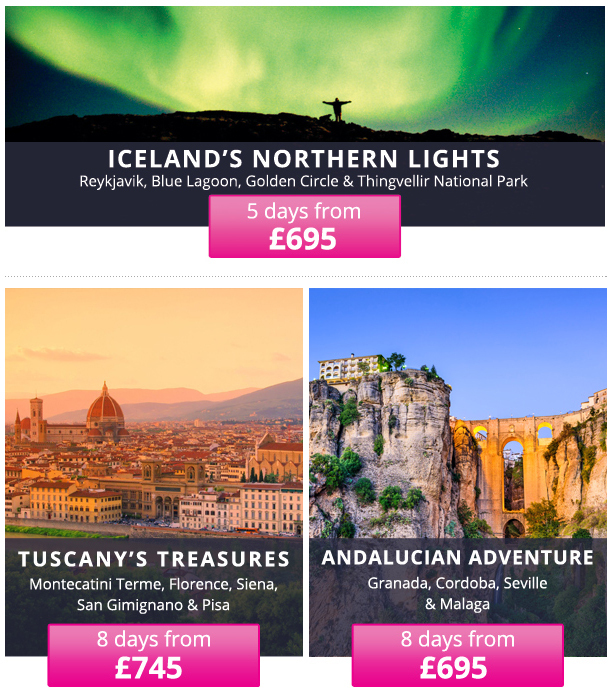 oour escorted tours include flights, transportation, accommodation, meals as specified, local English speaking guides, entry fees to all sights and, of course, unbelievable value for money! Are you ready for an adventure? These escorted small group tours will delve deep into a destination so you can get an authentic, extraordinary and more personal experience. Travel like the locals - from a horse and cart to a traditional cyclo - and know you're returning each night to a quality hotel. We've included selected meals if we think there's a local cuisine you have to try or it makes the journey easier; and incredible experiences, sightseeing and tips are often included. Our Highlights of Vietnam tour is perfect for first time visitors and includes an incredible overnight cruise in Halong Bay. You can also take a walking tour of Hoi An, hop on a cyclo to explore Hanoi and discover Ho Chi Minh City. Our Cambodia Explorer small group tour includes four nights in Siem Reap to really discover the temple complex of Angkor Wat. You can also enjoy a cyclo tour of Phnom Penh, cruise on the Tonle Sap Great Lake and take a foodie tour in Battambang. 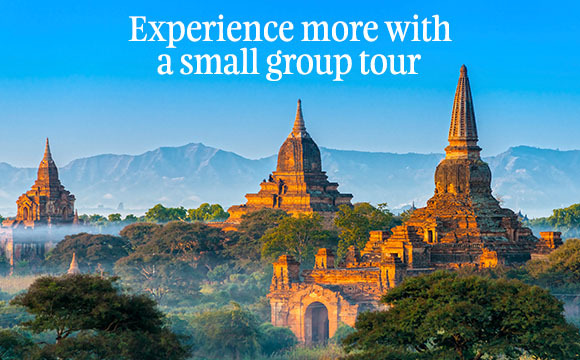 Discover Burma's historic, cultural and natural treasures on this fascinating journey. Sail down the Irrawaddy River, enjoy a local village bike tour and gaze out over Bagan's incredible pagodas. You can also see the unique fishing style on Inle Lake. With scenery from the jagged volcanic interior to its ruggedly-beautiful coastline, attractive and historical towns and cities, public gardens ablaze with floral colour and year-round subtropical sunshine, it’s little wonder Madeira is so treasured as a holiday destination. Discover the best of the ‘Pearl of the Atlantic’ on this great-value holiday. This 10 day, 8 night tour is the perfect way to explore the highlights of China. Incorporating the three major cities of Shanghai, Xi'an and Beijing - it gives you the chance to visit some of the most iconic sights including the Great Wall, the Terracotta Army, the Forbidden City and beautiful metropolis that is Shanghai. New Zealand truly is one of the most sublimely beautiful destinations on the planet and this comprehensive escorted tour includes the very best it has to offer. Spend three wonderful nights on the shores of beautiful Lake Maggiore, with an included excursion to explore the Borromean Islands. Then from Venice, join Norwegian Star for a relaxing cruise to the Greek islands, including Corfu - one of its largest, Santorini - with its blue-domed churches and picture-postcard vistas, and Mykonos - situated in the beautiful Cyclades. Conclude in the former 5th century capital of the Western Roman Empire, Ravenna. Our 9 day, 7 night tour allows you to experience the beautiful interior of Sri Lanka, exploring the delights of Dambulla, Sigiriya Rock and the colonial cities of Kandy and Galle. Visit ancient temples of past civilisations, wonder at the beautiful botanical gardens in Peradeniya, meet the elephants at the Pinnawala Orphanage and take a safari through Yala National Park. Delve into the spiritual fabric of this intoxicating country on our 17 day itinerary which showcases the complex heart of North India, from intriguing Hindu rituals upon the Ganges, to the Sikh's golden symbol of brotherhood in Amritsar and the colonial inspired Christ Church which crowns Shimla's snow-capped Himalayan peaks. Along the way, sample wild culinary delights, marvel at a chaotic tapestry of lost empires and discover one of the New Seven Wonders of the World, The Taj Mahal. Situated in-between North and South America, Costa Rica is a small but truly captivating country. Boasting incredibly rich flora and fauna with breathtakingly beautiful scenery the country offers a multitude of delights for travellers of all ages. America's Civil Rights Movement, music heritage and space exploration all came to a head in the explosive and exuberant atmosphere of the nineteen sixties. Marvel in the delights of this in-depth 17 day, 15 night journey spanning the entire length of Vietnam. Discovering rich history whilst exploring more remote areas, this tour combines the famous landmarks and hidden gems. 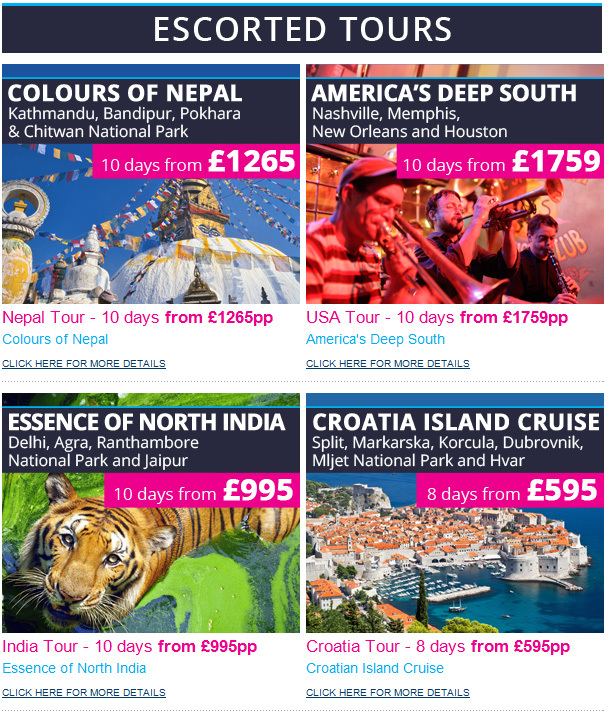 This amazing 16 day, 14 night tour journeys across one of the world's largest and most interesting countries, seeped in ancient history and brimming with world-renowned sights. 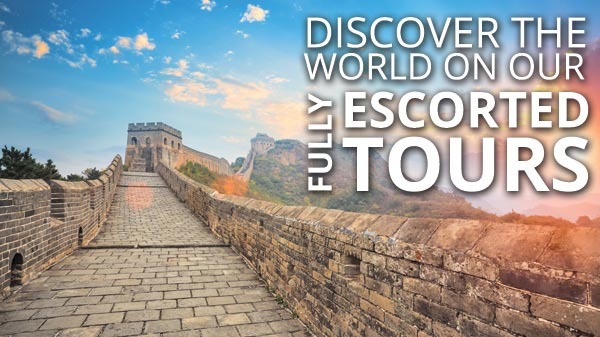 Cruise down the Yangtze River, experience Shanghai and Beijing, visit the Pandas in Chengdu and absorb the wonders of the Great Wall of China and the Terracotta Army all in one fantastic tour. The Hindu heartland of this fascinating subcontinent presents a dazzling array of experiences unique to the region; from colonial railways crossing bottomless gauges to priceless temple craftwork depicting spiritual legends, our in depth 16-day itinerary immerses you within this mystifying province. Cruise the palm-fringed backwaters of Alleppey, marvel at royal splendour in Mysore Palace and catch a glimpse of Kabini's allusive Bengal tiger. The region of Andalucia harbours a quintessential Spanish spirit of fiesta loving locals, sun-kissed monuments of lost kingdoms, unblemished terrains surrounding the mighty skiers paradise of Sierra Nevada and reckless inflections of flamenco guitars resonating within world-renowned tapas bars. With a timeless familiarity, rolling hillside vineyards crowned by frescoed churches and a legacy of artistic prodigies creating iconic masterpieces, the region of Tuscany truly captures Italy's romantic essence. With it's astonishing cosmic displays of the Northern Lights, bursts of geothermic water from prehistoric geysers and cinematic landscapes dominated by snow-topped mountain ranges, the vast volcanic laboratory of Iceland exhibits unforgettable natural treasures. In Sanskrit ‘Sri Lanka’ translates as ‘resplendent island’ but, before its modern name and evocative ‘Ceylon’, this country was known as ‘Serendib’, inspired through the 18th century writings of Horace Walpole the word ‘serendipity’ - the fortunate discovery of unexpected pleasures. This latter description is perhaps the most apt, as visitors to this teardrop-shaped Indian Ocean island may happen across magnificent fortresses atop mountains of rock, ancient capitals in the midst of dense forest land, cool hillside villages producing the world’s best tea, elephants roaming beautiful national parks, and gentle reminders of a British colonial past. Our tour to Ecuador and the Galapagos Islands is your chance to experience one-of-a-kind wildlife watching. Choose this tour for access to one of the most exclusive and premier travel destinations in the world. Experience the plucky frontier spirit of America's west coast on our 12 day adventure through inspiring landscapes, untamed sandstone backyards and cities with distinct personalities. Sicily, at the geographical and historical heart of the Mediterranean, has been coveted, fought over and colonised for millennia. As such, the island presents a unique culture, best exhibited in its architecture, language and cuisine, which bears the stamp of the Phoenicians, Athenians, Romans, Arabs, Normans, Byzantines and Bourbons. This comprehensive exploration introduces you to Sicily’s best-known treasures, including its superbly well-preserved Greek temples, legendary Mount Etna and splendid Monreale Cathedral. Brimming with snow-capped volcanoes, glaciers and geysers, Iceland is a breathtaking country, and the perfect destination for experiencing the colourful celestial wonder of the Northern Lights. On this two-centre tour, spending two nights each in the southern town of Hella and Reykjavík, you will explore dramatic scenery of mountains, mighty waterfalls and thermal springs - landscapes that inspired the writers of the Icelandic sagas and tenacious legends of elves and trolls. You’ll learn about the native Icelandic horse at the Fákasel Horse Park, marvel at the awesome power of the ice-capped Eyjafjallajökull volcano and the Golden Falls, watch the Strokkur Geyser erupt high into the air and take a relaxing dip in the warm mineral-rich waters of the Blue Lagoon, ending your journey in cosmopolitan Reykjavík. When imagining Brazil, endless jungle, Rio de Janeiro and vibrant carnivals spring to mind. Our new tour embraces all these, with the opportunity to meet Christ the Redeemer and perhaps watch extravagant carnival costumes and floats being created in captivating Rio de Janeiro. We also stand in awe of Iguazu Falls and watch the natural phenomenon at the source of the Amazon River. As a country that is approximately the same size as Europe and covers half the South American continent, there is much to see and our adventure continues to the state of Bahia, a place of beauty, magic and traditions, renowned for a constant celebration of happiness, kindness and spontaneity. Australia’s diverse natural history has evolved the country into a nature lover’s delight which has awed British explorers since James Cook and Joseph Banks set foot in 1769. It is now home to 15 World Heritage Sites and 550 national parks. Enjoy the best of both worlds as you unravel the history of the laid-back island of Malta amongst its chic harbour towns and ancient villages, and relax in the picturesque resort of St Paul’s Bay, where the beach is just steps away. Get to know beautiful Tuscany, as this holiday uncovers its traditions, landscapes, cuisine and incredible artistic heritage. A must for music fans, this journey clocks up visits to places graced by the likes of Johnny Cash, BB King and Elvis. The Mississippi River, New Orleans' French Quarter and a paddle steamer trip are other highlights. For a real treat, why not visit during Mardi Gras. There are few places on Earth where the contrast between traditional and modern is quite so marked as in Japan and on this holiday you'll discover many of its incredible highlights. Beginning in dazzling Tokyo, you'll go on to admire incredible views of Mount Fuji, see the beautiful Matsumoto Castle and visit the traditional city of Takayama. After riding the famous Bullet Train to Kyoto, you'll spend three nights exploring this charming city before heading to Hiroshima and uncovering its poignant history. Your journey ends in bustling Osaka, where you'll visit Osaka Castle and have some free time for shopping if you wish.